Moroccan Rachid El Morabity won the 2014 Marathon des Sables (MdS), his second victory at the race. In this interview, Rachid talks about the strategies he used to win the race this year, what the group dynamic was like among the frontrunners, and what his hopes are for next year’s 30th edition of the MdS. iRunFar: Hi, I’m Kirsten Kortebein of iRunFar, and I am here with Rachid El Morabity who is the champion of this year’s 2014 Marathon des Sables, and Samir Akhdar has decided to translate for us. So first of all, congratulations, Rachid. iRunFar: Thank you very much for helping us translate. Samir Akhdar: Not at all. Not at all. You’re welcome. 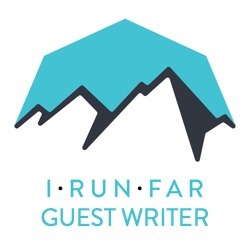 iRunFar: We just have a few questions about your race strategy and how you were feeling throughout this year’s race. What was your overall strategy going into each stage? It looked like you were racing really hard at the beginning of the stages and then just trying to maintain it in the second half. Talk about that a bit. El Morabity: Thank you for giving me this opportunity to talk about my victory. I ran the race in 2011 and 2012 and I know what is the problem I did. Now, I thought to make the strategy that it’s important to run the first three stages well and then the last one is just to see the other runners and be in the head (near the front). iRunFar: Yeah, that does seem like it has a lot of confidence behind it. It seemed that your racing strategy spoke of confidence for sure. How did you know that you’d be able to come back and catch those racers in the second half of each day? Or did you not know that? El Morabity: I prepared as much as I could for this race. I ran many times with Mohamad Ahansal and Salameh Al Aqra, and Abdelkader El Mouaziz, and this gave me to know what problems they have. So now I just have to run and have confidence in myself and try to learn from the problems they had. For this I succeeded being in the three first stages because I knew their problems. iRunFar: So then on the fourth stage when you saw Salameh go in front of you, were you still feeling confident because you were familiar with Salameh’s racing strategy or were you nervous when you saw him shoot ahead? El Morabity: I had 33 minutes on Salameh, and I knew the strategy that Salameh made for his running. He all the time went ahead in the first kilometers and then calmed down. I tried to make the contrast. I’d go slowly at the first and then at the end I would catch the minutes at the end. I had confidence in that way of running, and I succeeded in that. iRunFar: Okay, that does make sense then. So then for the marathon stage [Stage 5], what was your strategy then? Did you also try to take an opposite approach to Salameh or what was your thought process to your race on Stage 5? El Morabity: I had nine minutes on Salameh and I thought that it was good if I stayed just near Salameh, and I didn’t think about the other runners. The most important was Salameh and Ahansal. I had nine minutes and this most of the time is too hard for someone to gain nine minutes in just a few kilometers. So the most important was to go slowly and to stay near Salameh, and I succeeded in that. iRunFar: That worked out well. How does it feel for you to have your second win? You won in 2011 and then there were a couple years where in 2012, there was the femur break in the long stage, and then in 2013, not being totally ready to race again and having to pull out. How does it feel for you to have come back and made a strong statement with a win this year? El Morabity: For me, 2014 was the best year for me, and I was so much happy for that. I know a lot of people and I was so good in my physical condition, it was the best race I did in this physical condition. For me, I will not forget this race. I’m too happy. iRunFar: It’s been a really long journey for you from 2011 to this year. El Morabity: In 2011, I won. In 2012, my femur break. I learned so much from that experience. I had a lot of lessons that I took. Maybe that problem put me on the right stride. I learned many things from that to go straightly for the straight line. iRunFar: Right. Very good. What are your thoughts for 2015 and the 30th MdS? El Morabity: Next year I will participate and I hope that Lahcen Ahansal will be here and I want to win it with Lahcen. I hope that Abdelkader El Mouaziz and Mohamad Ahansal will be there because I’ve learned many things from them. iRunFar: Yes. Very cool. Wonderful. Thank you again so much, Rachid, and thank you Samir. Shukran bezzef. El Morabity: Thank you very much. iRunFar: Bezzef. Congratulations again. Thank you for translating. Akhdar: You are welcome. You are welcome.